Russet potatoes, also known as Idaho potatoes, baking potatoes or chef's potatoes, are sturdy, oblong tubers with thick, brown skin. Russets are all-purpose potatoes that work well for frying, steaming, baking and roasting. Russets are especially well-suited for boiling, and because of their high starch content, mashed russet potatoes are light and fluffy. 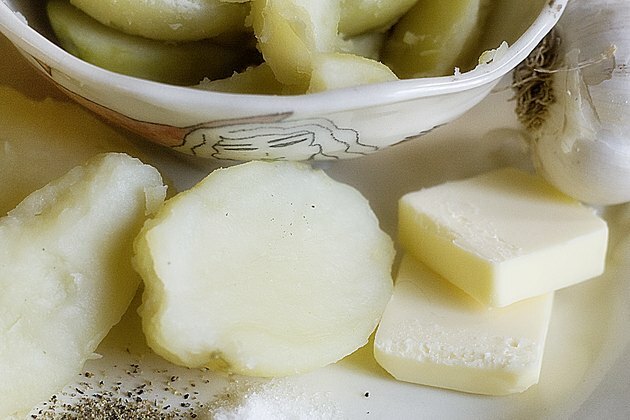 Top boiled russet potatoes with olive oil, sour cream or butter, and then season the potatoes lightly with salt and pepper. Wash the potatoes under cool, running water. 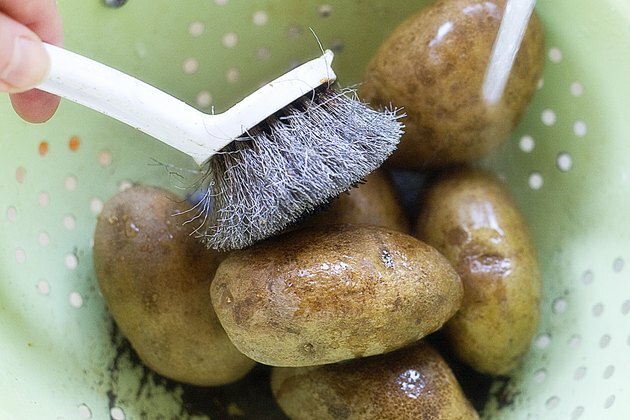 Scrub the potatoes thoroughly with a stiff vegetable brush. 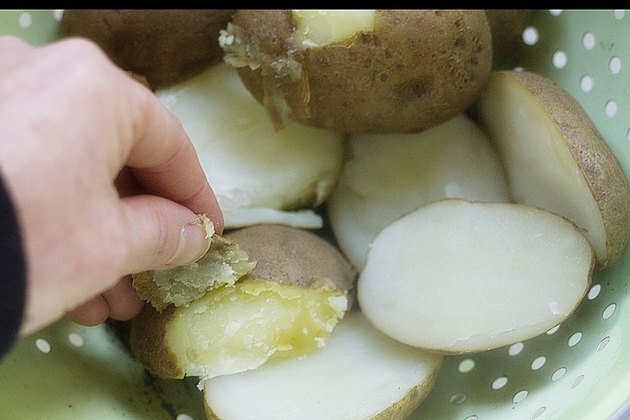 While you can peel the potatoes, leaving the peels intact preserves the flavor and nutrients in the peel. Cut the potatoes into uniform halves. If the potatoes are very large, cut them into quarters. Fill a saucepan with cold water. 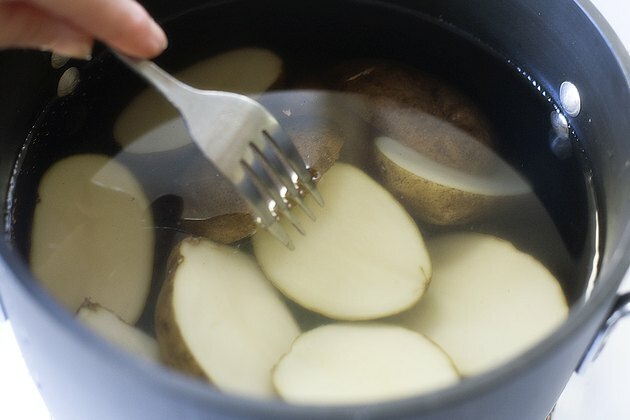 Use enough water to submerge the potatoes, plus about an inch. You can also simmer the potatoes in beef, chicken or vegetable broth, or in a combination of broth and water. 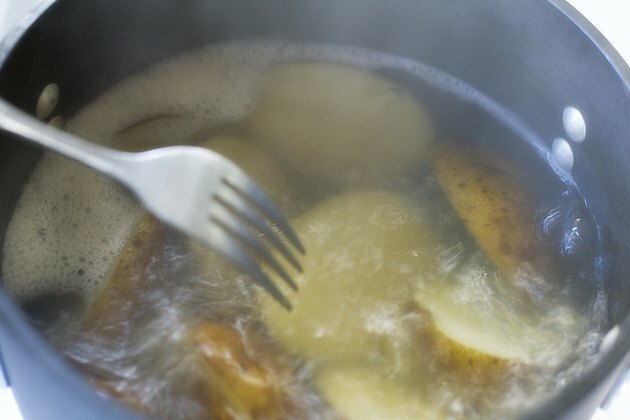 Place the potatoes in the cold water, and then bring the water to a simmer. Don't cover the pan. Simmer the potatoes for five or six minutes, and then poke one of the potatoes with a fork to test for doneness. The potatoes are done when they are tender and easily pierced with the fork. If the potatoes are still firm, allow them to simmer for a few more minutes, and then test them again. Pour the boiled potatoes into a colander to drain. Leave the potatoes in the colander until they're cool enough to handle, and then remove the peels with a paring knife. Keep an eye on the simmering potatoes. If the potatoes are overcooked, they become mushy and fall apart. Store russet potatoes in a cool, dark, well-ventilated place. The potatoes will last for up to one month. Don't store potatoes in the refrigerator because the cold temperatures affect the color and flavor of the potatoes. Don't wash the potatoes before storage.